Involving citizens in science is a crucial point but it's still not clear how to do it. While in the past centuries all scientists were amateur enthusiasts, the more systematic foundation of science fields has built up a gap between researchers and citizens. Citizen science aims to bridge that gap by providing platforms where citizens without formal science education can also contribute. The question is, how can we involve citizens and communicate with them in a better way? Niels Jørgen Gommesen is a Ph.D. student at the University of Southern Denmark, majorly interested in user involvement and new forms of communication with participants. How can citizens be a bigger part of the research and communication? 'Talking with' instead of 'talking to' citizens is an important step towards taking communication to the next level and creating a collaborative citizen science project where citizens and scientists can openly communicate, ask questions and generate new ideas together. 'The Sound of Denmark' project is the focus of Gommesen's research where he is studying how to design, implement and evaluate new forms of citizen science communication formats. 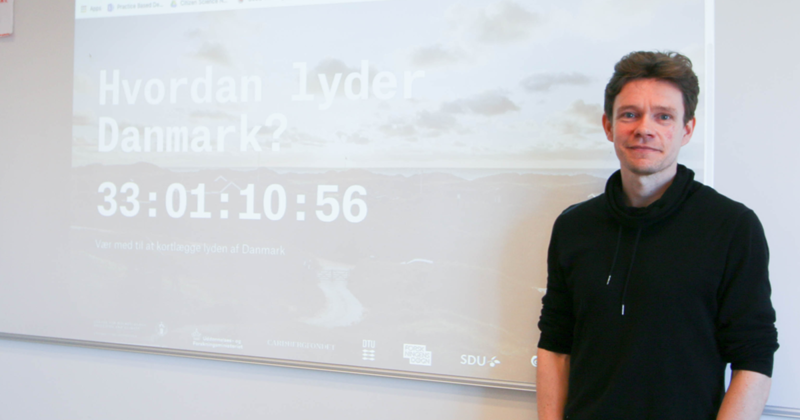 Lyden af Danmark (Danish for The Sound of Denmark) is a citizen science project being developed at the Natural History Museum of Denmark, enabling non-scientists to participate in mapping the Danish soundscape. The project co-designs and then evaluates a web application with an interactive map that citizens can use with their mobile devices to geolocate, generate and share urban or rural sound files from the whole country. Gommesen's focus is to find out how to engage citizens in the project. As a first step, he was working with potential users, mapping their needs and requirements. The most important goal in this phase is discovering any insights that could guide the design process. Revealing motivations and the emotions in relation to a particular research challenge is an essential step towards deeper user involvement and to strengthen citizens' capacity for participation. The Sound of Denmark web application will be launched on the 24th of April, including a forum where participants will be part of a semi-directed conversation with fellow citizens and the research team. The forum will have threads set up by the researchers but participants are also welcome to set up their own and ask any related question popping up in their mind. After the launch, this forum will be Gommesen's center of attention and also the second part of his research. He is going to observe the online communication but also what is happening in real life among users and evaluate the outcomes (ethnographic research). The forum aims to answer the participants' questions but also to give them a learning opportunity, a 'meeting spot' with like-minded people to share and discuss their interest. How to engage citizens in other projects? According to Gommesen, there is no easy recipe for engagement, it all depends on the specific project. For sure, some projects are harder to understand than others. Without formal science education, the world of quantum physics can be intimidating and hardly approachable. Citizen science has the power to bridge that gap and provide tools to non-experts which helps them contribute to science. Apart from research results, citizen science is also responsible for building a connection between the world of science and the public. Our ScienceAtHome team is ambitiously taking up the challenge of making quantum research approachable for citizens and more collaborative than ever. The second edition of our old flagship game, Quantum Moves 2 beta is including in-game tutorials and onboarding levels before the main levels which are actually relevant for research. The 'beta' version means that the game is still in a development phase. This is the time when your feedback can make the biggest impact! We need your input on how could we make it better. Let us know what do you think of it and how we could help you better understand the quantum challenges! Comment below or email us at support@scienceathome.org!